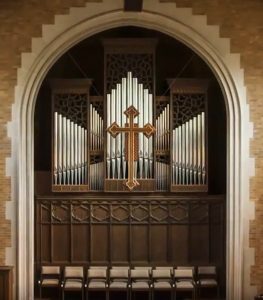 Since 1983, Plymouth Church in Milwaukee has enjoyed the sounds of its electric-slider-action pipe organ. It has served the congregation well in the past 30 years. However, tastes change and things wear out. Because of this, it had become apparent that some significant work should be directed to the instrument to update the console technology, correct some tonal imbalances, add some crucial new organ voices and stabilize the winding and chest actions of the organ. Buzard has been honored to be the people chosen to carry out this important work. As part of the process, a new 16′ Violone was added to the instrument to provide depth and warmth to the ensemble. Further, our Tonal Director, Brian Davis has carefully studied the instrument pipe-by-pipe, and will be did a painstaking tonal reassessment of the instrument. The final product is more technically reliable and more tonally radiant. Larry Wheelock is the Artist in Residence at the church. We thank him and the Parish for their faith in us to carry out this project! We are delighted to share this video with you! It was produced by Plymouth Church, Milwaukee member Barbara Parkman! We have paid the professional rights from Audio Network, Ltd. # 692631 to be able to have it in our Facebook feed and here on our website. Please enjoy!